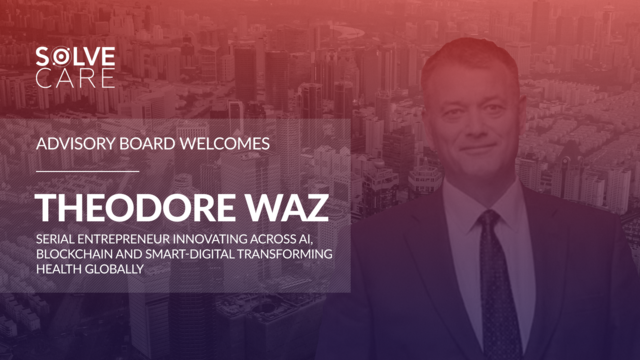 (PRLEAP.COM) Theodore Waz, a serial entrepreneur innovating across AI, blockchain, smart-digital and data-in-motion cyber security, focused ontransforming the healthcare, fintech, data science and cyber security industries, has joined the Solve.Care Advisory Board. Waz knows very well how innovation and transparent business models can be used to improve access, security and connectivity. "Solve.Care is the future of decentralized, ultra-secure and accessible healthcare providing innovative solutions to the most burdensome, yet all to common, healthcare problems. Solve.Care combines the best practices of USA and International healthcare via Blockchain and AI technologies, and is flexible enough to meet the unique needs of both USA and International Markets. " said Waz. "Becoming an Advisor alongside Solve.Care's exceptionally talented Advisory Board will accelerate global expansion, while ensuring accessability by markets in desperate need innovative technology focused on impoving the health or our communities. In the end it is all about the health of our our children, parents and loved ones…"
Solve.Care CEO Pradeep Goel couldn't agree more: "We are so excited for Ted to join our growing team. He has a proven track record in the healthcare industry worldwide, and understands that the future of healthcare revolves around innovative blockchain, AI, and digital technologies." Waz continues, "Solve.Care is already transforming legacy healthcare systems, and this is tremendously exciting for the wellness of our health systems and our communities." Solve.Care Foundation was established with the goal to revolutionize administration of healthcare and other benefit programs globally. The stated mission of Solve.Care is to "Make healthcare and benefit programs work better for everyone." The platform brings a relationship centric approach to care coordination, administration and payments that addresses all three pillars of healthcare: clinical, administrative and financial.